CarGurus has 9,507 nationwide Armada listings starting at $1,950. 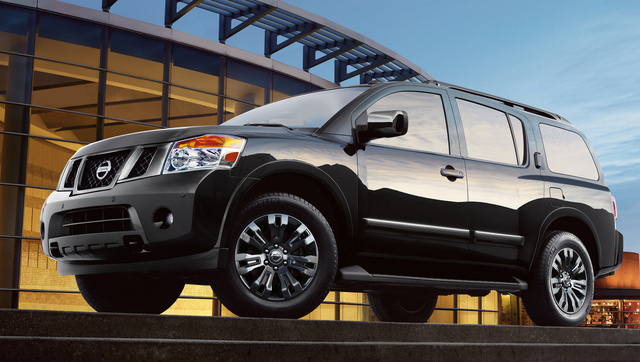 If “Go big or go home” is a motto you use, the 2015 Nissan Armada may be just your thing. The Armada is Nissan’s answer to the Toyota Sequoia, Ford Expedition, and Chevrolet Suburban. It’s big, brawny, and named for a fleet of warships. Fitting. The 7- or 8-passenger Armada can haul a very large family and tow a large trailer, and do all that in a snowstorm if need be. Buyers can choose either a three-across bench in the second row or captain's chairs, an option available on all three trim levels. The Armada offers just one engine, a burly gasoline V8, but 4-wheel drive is available on all trims. The 2015 Armada is an aging design. 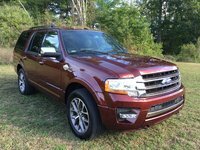 This old-school SUV was released as a 2011 model and is due for an update soon. It has a body-on-frame rear-drive design with 4WD added to that. Think of as a pickup truck with a cabin. Reviewers say its ride is “trucky,” but that's typical for this type of vehicle. Those who want a crossover might be happy to find the Nissan Pathfinder is very modern and more car-like in many ways. New this year to the 2015 Armada are revised interior trim and new optional 20-inch wheels. Blue Magnetic Black and Arctic Metallic are new colors, and Pearl White is available on the top trim. Power lumbar support for the driver is added for 2015. Inside, the 2015 Armada offers a spacious area for the driver and front passenger, and those that sit in back will also have as much comfort as one can expect in anything other than a minivan. This is particularly true if the Armada is outfitted with the captain's chairs in the second row and if only two passengers use the way-back seats. The center rear-most seat is a jump seat of sorts. The interior of the Armada features available leather, a rear-view monitor, moonroof, second-row entertainment system, and many other amenities. Standard features include Bluetooth, adjustable pedals, and dual-zone HVAC. The front two passengers can control their climate, and those further back can fight over the controls for that separate zone. Power flip-out third-row windows are available, and that's a feature that anyone hauling a pee-wee hockey team home in the summer will no doubt appreciate. The 2015 Armada’s V8 engine provides a healthy 385 lb-ft of torque at a very low 3,400 rpm. That means this truck has low-end grunt. When not towing, the Armada can pass anything except a gas station. Its 5-speed automatic transmission is low on gears by modern standards, but the Armada is one of the last Nissans without a continuously variable transmission, which some drivers do not prefer. The All-Mode 4WD system in the Armada behaves like an all-wheel drive system, running in two-wheel drive mode most of the time and switching automatically to 4WD when traction is needed. The Armada can tow a trailer of up to 9,000 pounds. This is one thing that separates this vehicle from crossover-type vehicles with similar seating. The 2015 Nissan Armada offers three trims: SV, SL, and Armada Platinum. There are packages within each, and the top of the line is the Armada Platinum Reserve. This trim features an almond leather interior with chocolate trim and accent stitching that looks yummy. Kidding aside, we love to see leather interiors offered in colors other than all black. Prices range from about $39K to about $55K. We hesitate to dive deeply into the available trim offerings, because this is a very low-volume vehicle. Nissan sells fewer than one thousand in most months. It would be best to phone dealerships or use a website to locate available models and spend time speaking to a salesperson about what's available unless you plan to order an Armada. The EPA estimates that the two-wheel-drive Armada will deliver 13 mpg city/19 mpg highway/15 combined. The 4WD Armada is a touch thirstier and gets 1 mpg less across the board. The Armada is available as a Flex Fuel vehicle in some markets. Those with the capability to run on E85 get about 20% lower fuel economy when running on E85. These numbers may shock those also considering 8-passenger crossovers, but they are not out of line with the other body-on-frame SUVs in the market. Although the Armada has not been rated by IIHS, it's so big that safety seems assured. The Armada may be just right for a small segment of buyers who need a huge, rugged, and also comfortable vehicle. What's your take on the 2015 Nissan Armada? Users ranked 2015 Nissan Armada against other cars which they drove/owned. Each ranking was based on 9 categories. Here is the summary of top rankings. 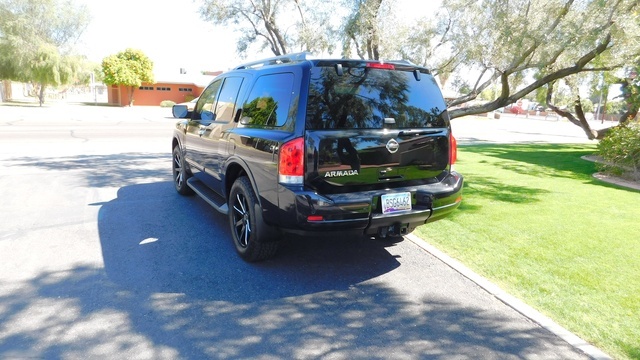 Have you driven a 2015 Nissan Armada? What Do I Do If Dealership Does Not Honor Posted Price? Clay Cooley Nissan at Dallas Texas will not honor posted price of $25,341 for 2015 Nissan Armada. What can I do?